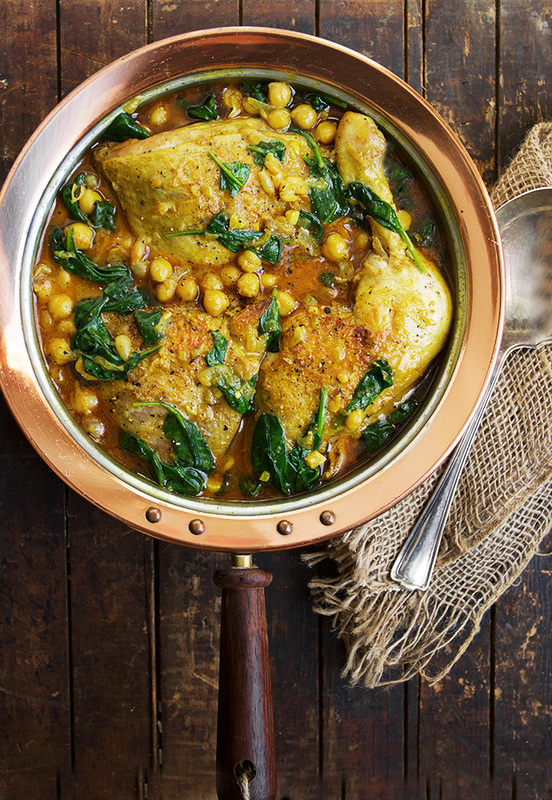 Delicious Indian-Spiced Chicken with Chickpeas and Spinach, in a lightly creamy (with yogurt!) sauce. 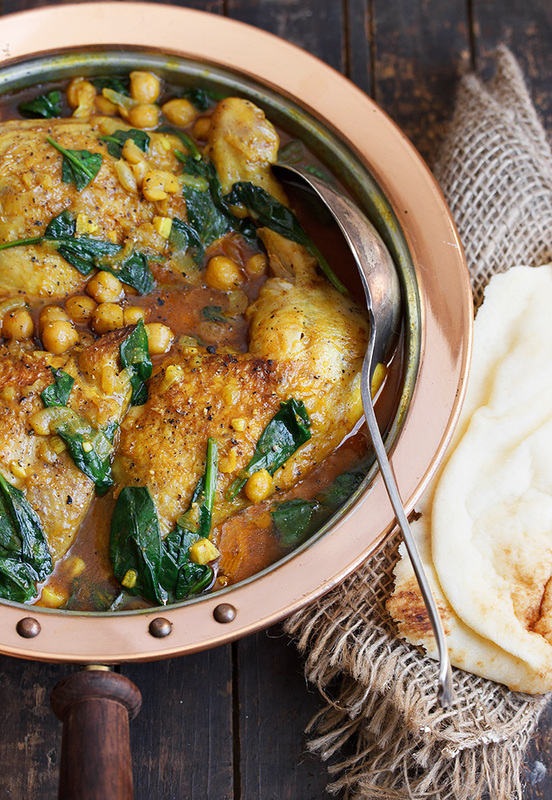 Serve with some Naan bread for a great meal. We are all fans of Indian spiced food in this household and I always love the dishes that pack lots of good stuff in to one pan. 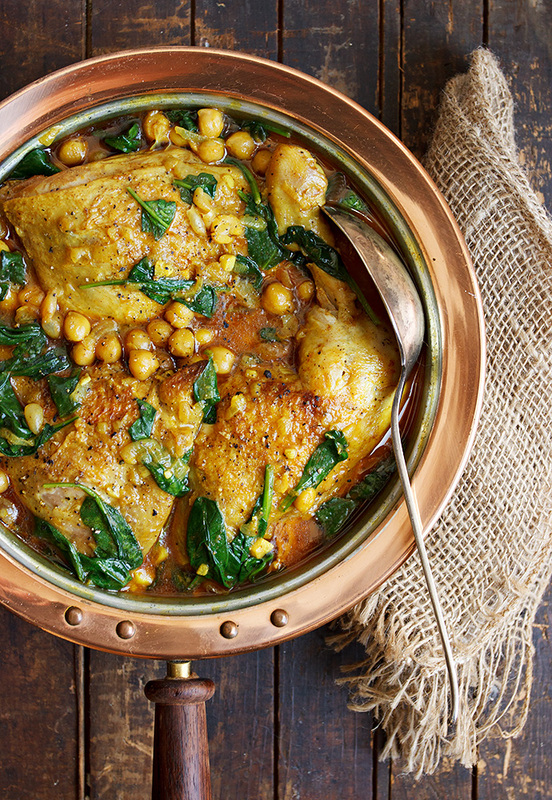 This dish has lots of chickpeas for fibre and spinach, for vitamins and iron. I love the colours! The sauce is not overwhelmingly spicy. If you like a little heat with your Indian dishes, up the cayenne pepper, to taste. This dish uses yogurt for a bit of creaminess, which is added right at the end. I used chicken legs for this dish. Chicken thighs or breasts would also work well, although cooking time will vary. I like bone-in/skin-on for the extra flavour, but since the chicken is braised, you could easily substitute boneless/skinless without worry of them becoming too dry. Again, cooking time to done may vary. Adjust the spices in this dish to your liking. As written, it is pleasantly spiced. If you might like it more assertive, increase all the spices a bit. For more heat, increase the cayenne pepper, to taste. Delicious Indian-spiced chicken dish, that's lightly creamy from the yogurt. If you like a bit more heat, increase the amount of cayenne pepper, to taste. 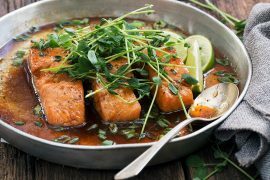 You can substitute bone-in/skin-on chicken breasts or thighs or boneless/skinless chicken, but the cooking time will vary, so check regularly during cooking. The juices should run clear when a knife is inserted in it. Preheat oven to 325° F. with rack in lower 1/3 of oven. Pan chicken dry and season with salt and pepper. Heat 1 Tbsp. 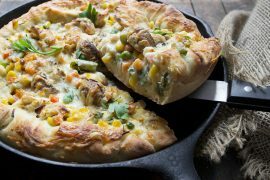 oil in an oven-safe pan (with a lid, such as a Dutch oven) on stove-top over medium-high heat. Brown chicken on both sides until golden and remove to a plate. Add butter and onions to pan (don't remove drippings unless excessive). Cook, stirring regularly, until onions are soft and golden brown, about 10 minutes. (Don't rush browning the onions, as cooking them to golden adds great flavour to the dish). Stir in garlic, ginger and spices. Cook, stirring constantly, about 1 minute. Stir in chickpeas and 2 cups of broth. Return chicken to pan and any accumulated juices. Liquid should cover chicken by about 2/3. If not, add a bit more broth to top up. Bring liquid to a simmer, then cover and transfer to the pre-heated oven. Cook until chicken is fork-tender, about 45 minutes, depending on the cut of chicken you used. Remove from oven and transfer chicken to a plate. Cover with foil to keep warm. To hot liquid in pot, add spinach. Cover and let stand about 5 minutes, or until spinach is wilted. Stir in yogurt. Taste and season with salt and pepper, to taste. (If sauce is not as thick as you'd like, mix a bit of the sauce with a couple of teaspoons of cornstarch to make a paste. Add a bit at a time to the warm sauce and stir until desired thickness). Return chicken to pot and warm over low heat (do not boil or yogurt may curdle). 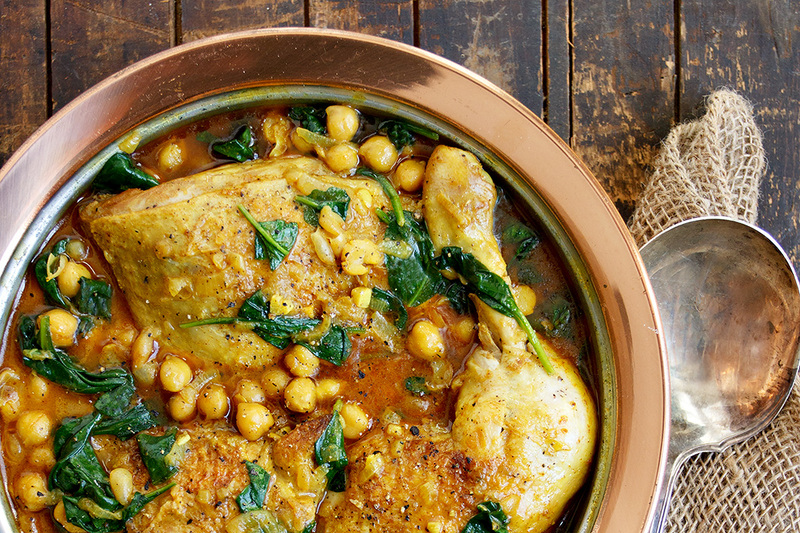 Transfer chicken to a serving platter and pour spinach and chickpea sauce over. Sprinkle with chopped cilantro or parsley. One of my favorite recipes from Seasons and Suppers. Consistently delicious and great for a one-pan weeknight meal! So glad to hear, Vivi :) It is one of my favourites, for sure. I just love the spices in this one! Made this for dinner last night and the flavors were wonderful. The color of the sauce was vibrant and I kept thinking no curry? I made it with chicken thighs and drumsticks and served it with brown rice and naan bread to absorb the broth. Great meal for a fall evening. Hi Jennifer. Loved to see this rendition of this Indian dish. Since you love to experiment, i would suggest try adding a paste of fried onions(sliced onion fried in oil..yes that will soak in some oil and make your dish oily..but all worth it) with the yogurt and then add them to the sauce. This will not only give it an amazing colour but also improve the texture of the gravy. How good does that look? Dinner, sorted! Used skin-on/bone-in chicken thighs. (Since sauteeing isn’t a favourite of mine, legs or breasts will be used next time!) This dish was yummy! Even though the naan was store-bought, it was very good. I used more broth (’cause I didn’t read correctly!) but that was a good mistake. We thought the dish would be good over rice also. And the leftover sauce has been saved for naan/bread dipping! 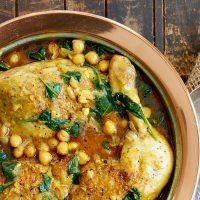 My husband is not a chick pea fan but your recipe won him over! I now have a recipe with chick peas that I can make again! Made this tonight. Two thumbs up by all! 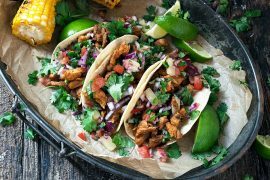 This is exactly what I’m craving for dinner tonight and a side of naan is a must! What a standout dish, Jennifer! 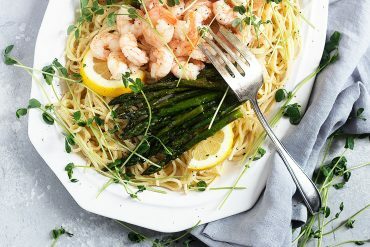 Your photography always blows me away and the gorgeous colours and flavours of this recipe jump right off the page. I could just take a chunk out of my screen right now! There is no doubt in my mind that this is a fantastic meal. The color alone draws me in. We love a good spicy meal and Indian flavors are at the top of the list. Have a lovely weekend! I never knew Indian food could look so pretty! I love all of the different spices you’ve got going on here, I’m sure it’s totally delicious. You’re in your element, Jennifer — this looks spectacular! We love our Indian food here, so this is going on the menu for sure. I just noticed that you put together a group of your best chicken dinners, I’m heading over to it now, yum! Thanks Sue :) It’s a really delicious dish and pretty easy, too! Jennifer, I absolutely adore Indian food and this dish is totally making me drool! Your photos are amazing (as usual)!! Thanks for sharing. Can’t wait to try! Thanks Mary Ann :) Everyone here loves Indian food as well!